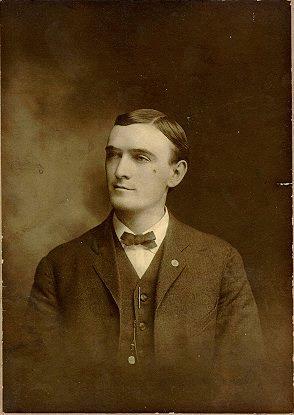 My grandfather John Michael Burns was born in Chicago, Cook County, Illinois on September 10, 1876. He was the son of Michael Burns and Margaret Cowhey Cagney Burns. 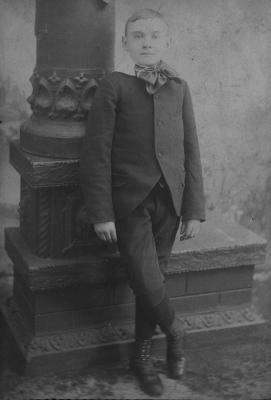 John Michael Burns as a boy. 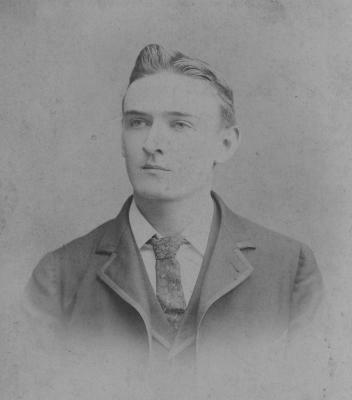 John Michael Burns as a young man. 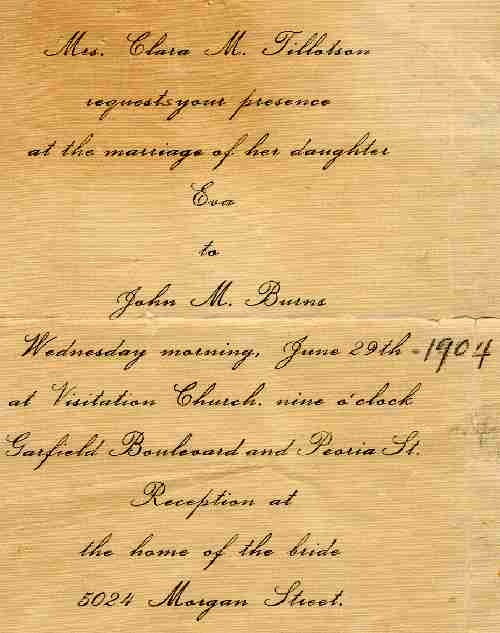 The marriage of Miss Eva Tillotson, daughter of Mrs. Tillotson of 5024 Morgan street, to Mr. John Burns took place Wednesday morning, June 29, at 9 o'clock at Visitation church. Solemn high mass was sung by Rev. Father McGuire. The bride was attended by her intimate school friend, Miss Minnie McKelay, and Mr. Frank Tillotson was best man. After the ceremony a reception was held at the family residence. Many costly and valuable presents were received by the bride. After an extended journey of the lakes Mr. and Mrs. Burns will be at home August 1 at the Schroeder Flats, Fifty-first and Carpenter streets. Mary Burns (1905-1905) died as an infant. She is buried with my great-grandmother Clara M. Stahler Tillotson in Mount Olivet cemetery. Margaret Adele Burns (1906-1994). She is buried in Queen of Heaven cemetery in Hillside, Illinois. Grace Evelyn Burns (1909-2001). She is buried with Margaret in Queen of Heaven cemetery. John Edward Burns (1911-2007). He married Arlene R. Ruthenberg (1917-2000). They had three children. John was a lawyer and professor at DePaul University in Chicago, Illinois. John is buried with his parents and his sisters Margaret and Grace in Queen of Heaven cemetery. 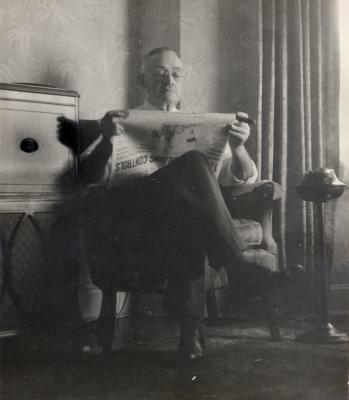 Robert Francis Burns, my father (1914-1999). He is buried in Calvary Cemetery in Evanston, Illinois. John worked as an accountant and credit manager for the Western Electric company. He was a gentle man who loved to smoke cigars and who loved music. He played the violin and mandolin. He was also a fan of professional wrestling on television. I learned to enjoy that form of entertainment by watching with him as a young child. John met his wife Eva Josephine Tillotson while they both worked for Western Electric. Eva operated accounting machines, so it was natural they would meet. John and Eva possessed good mathematical abilities, as did Eva's sister Jennie May Tillotson. Eva also played the mandolin. John said his full name was "John Michael James Joseph Patrick Henry Burns". One of the extra names may have been a confirmation name. An early school document lists his name as "John James Michael Burns." I don't know where the other names originated. John and Eva experienced a close brush with death on Saturday, July 24, 1915. The Western Electric company was holding its annual company picnic in Michigan City, Indiana. Excursion steamers were hired as transport from Chicago to Michigan City. One of the steamers was the Eastland. My grandparents arrived just a few minutes too late to board the Eastland, which had been declared full right before they arrived. John and Eva had been delayed by a neighbor's request to help with silverware settings for her daughter's wedding. This delay proved fortunate. Almost immediately after all the 2,572 passengers were aboard, the Eastland tilted to one side, slowly rolling over, even though the ship was still moored to her dock between LaSalle and Clark Streets on the south bank of the Chicago River. While some passengers managed to swim to shore unharmed, 844 died. This was the single worst disaster in Chicago history in terms of loss of life. My grandfather stayed on to help with the grisly task of recovering the bodies from the water. My grandmother returned home, vowing never to travel on water. And she never did. Like so many others, John was forced to take an early retirement as a result of the Great Depression. He retired from Western Electric in December 1933 after thirty-four years of service. Luckily by this time his daughters Grace and Margaret were employed and brought in enough money to support the family. John habitually strolled around the neighborhood after dinner, stopping by to chat with friends, or attending a show at the local theatre. One evening his daughter Grace placed a hollowed-out orange peel on the top of his head without John realizing what she had done. He was surprised as he walked around to find that everyone was staring at him. Yet no one he spoke with during his walk mentioned the odd head ornament. He did overhear one person whispering about the "horrible wound" on his head. Not until John arrived home to peels of laughter did he realize what had happened. 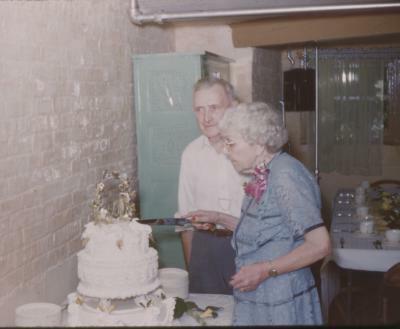 John and Eva celebrated their fiftieth wedding anniversary in 1954. By this time Eva's health had started to deteriorate. She died two years later at her home. Fiftieth wedding anniversary for John and Eva Burns, 1954. After Eva died, John lived with his daughters Grace and Margaret and his sister-in-law Jennie May Tillotson Vandenberg. John died December 17, 1959 in Chicago. He is buried with Eva and three of his children Margaret, Grace, and John in Queen of Heaven cemetery in Hillside, Illinois. 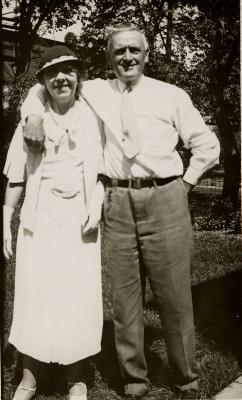 John and Eva Burns in the early 1930s. 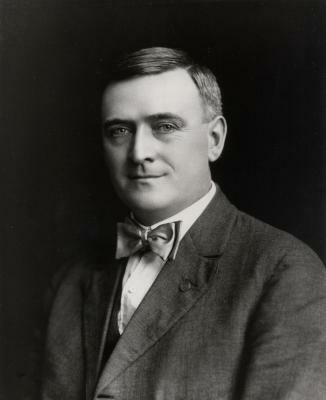 John Michael Burns in middle age. John Michael Burns in old age. and smoking the ever-present cigar. Back to my Burns genealogy page. Back to my Tillotson genealogy page. Last modified by pib on August 1, 2010.